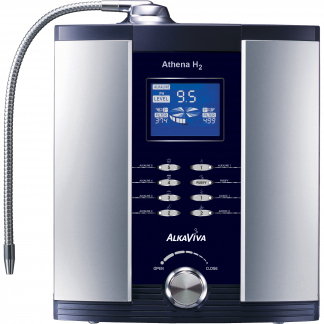 The AlkaViva Vesta H2 is an innovative 9-plate water ionizer with a new, advanced SMPS power supply, Smart-Design Electrodes, Auto-Adjust Power feature and DARC cleaning system. A futuristic Hydrogen Infusion Technology design optimizes performance, especially in the production of molecular hydrogen (H2.) 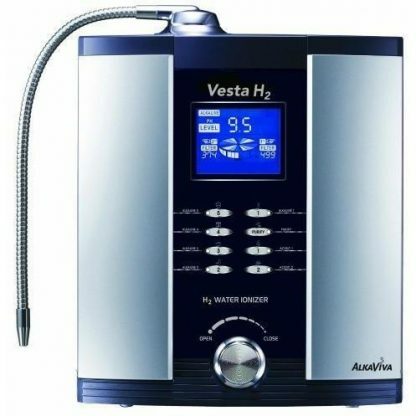 The Vesta H2 performs especially well in –ORP and H2 production at lower drinkable levels of pH water. A high-performance standard, solid reliability, and beautiful packaging makes the Vesta H2 the new standard in the water ionizer industry. Nine Plate Platinum Coated Titanium Smart-Design Electrodes – State of the Art SmartDesign Electrodes are high performance, extremely reliable, and designed to run with the utmost efficiency at all levels of pH water production. SmartDesign creates an ideal balance of electrical power to the electrodes (water cell.) This means optimized performance and efficiency, improved H2 presence and less degradation of the water cell. Cheers to better water Arrived earlier than the estimated date. I had it installed yesterday and now I am more confident in drinking my water. Thank you! Worthy gift for my family I got the Vesta before the holidays of 2018 and just writing this review now because I want to put it into test. I expected nothing but the best from it and the Vesta did not disappoint. 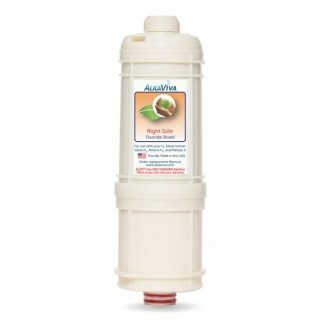 The controls are very easy to manipulate since they are basically user friendly but the best part about this is that it doesn't just purifies the water we drink everyday, it also has a mechanism to clean itself. Talk about efficiency. I am letting my co-workers know about this product since I got this and I just want to share this amazing product with everyone else. Five Stars Water tastes amazing! 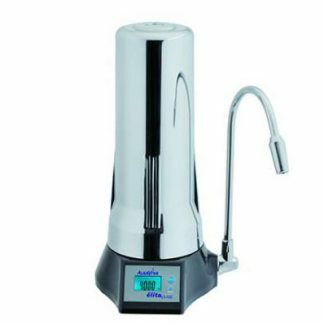 Love it, easy to setup Excellent water ionizer and easy to install. Very high quality product. Extremely pleased! Great machine This is pricey but well worth it. I started drinking the water from this ionizer and my health has been improving since. I stopped taking a medication that I've been on for five years and hopefully can get off of more medications soon. The Vesta water tastes amazing and I couldn't imagine drinking anything else.